Ysabel Prinzessin von Bayern was born on 20 July 1954.1 She is the daughter of Konstantin Prinz von Bayern and Helene Gräfin von Khevenhüller-Metsch.1 She married Count Alfred Hoyos, son of Count Heinrich Hoyos and Maria Therese Baronin Mayr von Melnhof, on 30 May 1976. Don Luis Alfonso de Baviera y de Borbon, Infante of Spain was born on 6 December 1906 at Madrid, SpainG.1 He was the son of Ferdinand Maria Ludwig Franz Prinz von Bayern and Maria Teresa de Borbón y Habsburgo, Infanta de España.1 He died on 14 May 1983 at age 76 at Madrid, SpainG. He gained the title of Infante of Spain.1 He was given the name of Luis Alfonso Fernando Cristino Adalberta Teresa Maria de Guadalupe Santiago Isidro Ramon Jose Antonio Maria at birth. 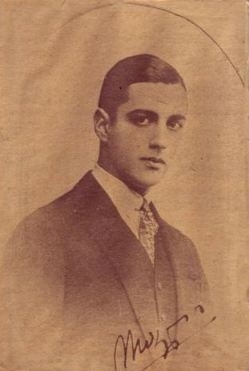 He gained the title of Infante d'España.1 He gained the title of Count Odiel.1 He was given the name of José-Eugene Alfonso Ferdinand Mariano Teresa Antonia at birth. [S12] C. Arnold McNaughton, The Book of Kings, volume 1, page 477. She gained the title of Condessa de Odiel. [S12] C. Arnold McNaughton, The Book of Kings, volume 1, page 477, says 30 Spe 1913. [S213] Unknown author, "unknown article title," European Royal History Journal: volume 8.6, page 39. Dona Maria de las Mercedes de Baviera y de Borbon, Infanta d'España was born on 3 October 1911 at Madrid, SpainG. She was the daughter of Ferdinand Maria Ludwig Franz Prinz von Bayern and Maria Teresa de Borbón y Habsburgo, Infanta de España.1 She married Irakli Georgeievich Bagration-Moukhransky, Prince Bagaration-Moukhransky, son of Georgii XIII Aleksandrovich Bagration-Moukhransky, Prince Bagration-Moukhransky and Elena Zlotnicka, on 29 August 1946 at San Sebastián, SpainG. She died on 11 September 1953 at age 41 at Madrid, SpainG. Irakli Georgeievich Bagration-Moukhransky, Prince Bagaration-Moukhransky was born on 3 April 1909 at Tiflis, GeorgiaG. He was the son of Georgii XIII Aleksandrovich Bagration-Moukhransky, Prince Bagration-Moukhransky and Elena Zlotnicka.2 He married Dona Maria de las Mercedes de Baviera y de Borbon, Infanta d'España, daughter of Ferdinand Maria Ludwig Franz Prinz von Bayern and Maria Teresa de Borbón y Habsburgo, Infanta de España, on 29 August 1946 at San Sebastián, SpainG. He died in 1977. Fernando de Mesía y Fitzjames-Stuart, 6° Duque de Tamanes was born on 23 October 1881. He is the son of José de Mesía y Gayoso de Los Cobos, 4° Duque de Tamanes and María de La Asunción Rosalía Joaquina FitzJames-Stuart y Portocarrero-Palafox, 1° Duquesa de Galisteo. He married Marie-Solange de Lesseps, daughter of Ferdinand de Lesseps, Vicomte de Lesseps and Louise-Hélène Autard de Bragard, on 11 January 1910 at Paris, FranceG. He gained the title of 12th Duque de Mora.1 He gained the title of Duque se Tamames. Marie-Solange de Lesseps was born on 17 September 1877 at Chateau de la ChesnayeG. She is the daughter of Ferdinand de Lesseps, Vicomte de Lesseps and Louise-Hélène Autard de Bragard.1 She married Fernando de Mesía y Fitzjames-Stuart, 6° Duque de Tamanes, son of José de Mesía y Gayoso de Los Cobos, 4° Duque de Tamanes and María de La Asunción Rosalía Joaquina FitzJames-Stuart y Portocarrero-Palafox, 1° Duquesa de Galisteo, on 11 January 1910 at Paris, FranceG. Her married name became Mesia. Dona Maria Cristina de Baviera y de Mesía was born on 6 February 1935 at Paris, FranceG. She is the daughter of Don José-Eugene de Baviera y de Borbon, Infante d'España and María de La Ascunción Solange de Mesía y de Lesseps, 1° Condessa de Odiel.1 She married Don Juan Manoel de Urquijo y de Morales on 21 July 1967 at Madrid, SpainG. She gained the title of Condesa de Odiel. She was given the name of Maria Cristina Paz Teresa Alfonsa Eugenia Rita at birth.